The 26th edition of the Sur International Journal on Human Rights, published by Conectas Human Rights in collaboration with The Fund for Global Human Rights, seeks to address the imbalance in material currently available on the global crackdown on civil society, the majority of which focuses on the diagnostics, rather than the responses by activists. Conectas and The Fund - in partnership with the Human Rights Consortium at the School of Advanced Study, University of London - are delighted to host a panel discussion, followed by a drinks reception, with the aim of sharing the body of knowledge captured by the Journal with an audience of scholars, practitioners and donors. 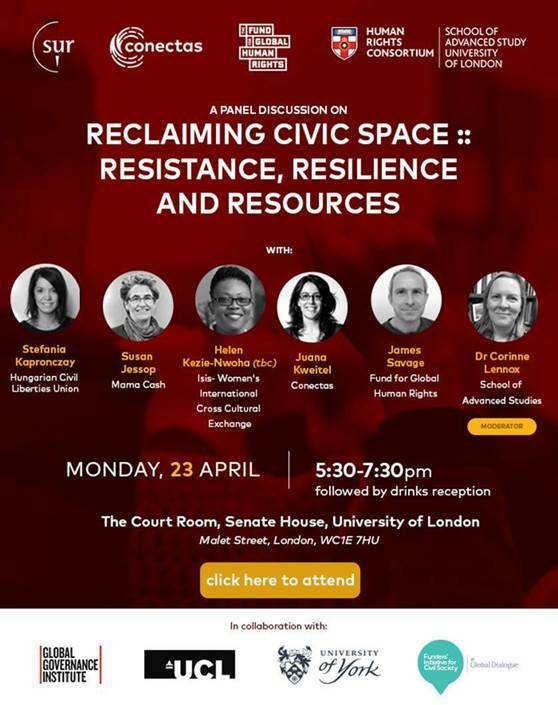 In collaboration with the Global Governance Institute, University College London; Centre for Applied Human Rights, University of York; the Funders' Initiative for Civil Society; and the Human Rights Researchers’ Network.